The E.G. series is our newest process series. Developed for higher printing strengths and hi flow, the E.G. series has been successfully tested and approved for SWOP and G7 color management. Compatible with all common fountain solutions, allowing very wide ink and water balance control. Fast color startups, even with non temperature controlled pressrooms, saving costly waste. Compatible with all board types sbs, ccnb, cckb. Will stay open in ink fountain for 90-100 hours yet able to post finish on board stock within hours. Very Eco-Friendly, very high vegetable based with little to no VOC's, a very renewable product. Consistent dot gain yielding neutral gray balance, allowing ease of color matching and press proofing. These new process inks produce incredibly vibrant colors not seen with conventional inks. 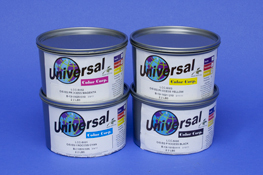 MEGA-BRITE inks are a four-color process series designed to be used with existing conventional curves. The idea is to produce a more bright and vibrant color not achievable with traditional four-color process inks.